Avian flu. Terrorist threats. Natural disasters. The issues that make today's headlines define the mission for Dr. Paul Effler, chief of the state Health Department's Disease Outbreak Control Division. "I think we all probably recognize that a pandemic influenza is likely in our lifetimes," said Effler, state epidemiologist since 1997. The 45-year-old doctor and his staff use the latest technology to prepare for such public health threats and protect Hawaii's people. But Effler still relishes the traditional tools of a detective: shoe leather, conversation, and getting his hands dirty. "He's a great leader -- a very hands-on type person, not someone who just gives instructions," said Michele Nakata, chief of the disease investigations branch. "He's out there at 1 o'clock in the morning, digging through garbage pails" to track the source of a foodborne illness. Effler's vision and zeal have helped keep the state a step ahead in dealing with potential problems in a field that seems to grow every year. His job description is diverse: preparing for a bioterrorist attack; tracing the source of tainted carrots that sickened air passengers; tracking down mosquitoes that spread dengue fever. As a tourism hub, Hawaii faces heavy risks from infectious disease. One threat on the radar screen is the deadly avian flu that has spread from Southeast Asia and could eventually develop an ability to spread among humans. Last year, under Effler's guidance, the state began screening travelers with flu-like illnesses using laboratory diagnostic tests at the airport for the first time. The federal government is now considering adapting that surveillance system for use nationally. 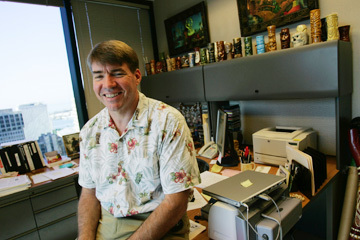 The Cincinnati native came to Honolulu to earn his master's in public health at the University of Hawaii in 1990. He later worked for the Centers for Disease Control and the World Health Organization, returning with global experience. "It's not just a job for Paul, he's really passionate about his work," said Dr. Chris Derauf, director of the pediatric residency program at the University of Hawaii and a longtime friend. "He motivates everyone around him."